Sarah Walton is one of the very few producers of saltglazed tiles in this country. These are suitable for both interior and exterior use. An appreciation of the way surfaces are eroded over hundreds of years by the effects of use and weathering has been the inspiration for these tiles. The material used is stoneware clay, so the tiles are therefore very hard indeed. Some warpage occurs with such high fired wares and this contributes to the final surface of great three dimensional and tactile richness. Their colourings can be compared to English medieval tiles of the 12th to 15th centuries. As with these, earth colourings predominate, ranging through grey, cream, pink, orange and red to rich dark brown. 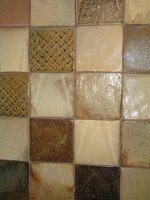 There is a variation of tone across each tile, which makes no single tile of uniform colour. The distinctive mottling and iridescence of their surfaces result from their being saltglazed. No two are the same. The dappled effect built up with such tiles makes a very effective decoration of its own. 1) Small: 4.3/8" x 4.3/8" x 1/2" - £13 each. There are 64 to the square yard, therefore £832 per square yard. 2) Large: 5.7/8" x 5.7/8" x 1/2" - £20 each. There are 36 to the square yard, therefore £720 per square yard. Delivery charges extra. No VAT.